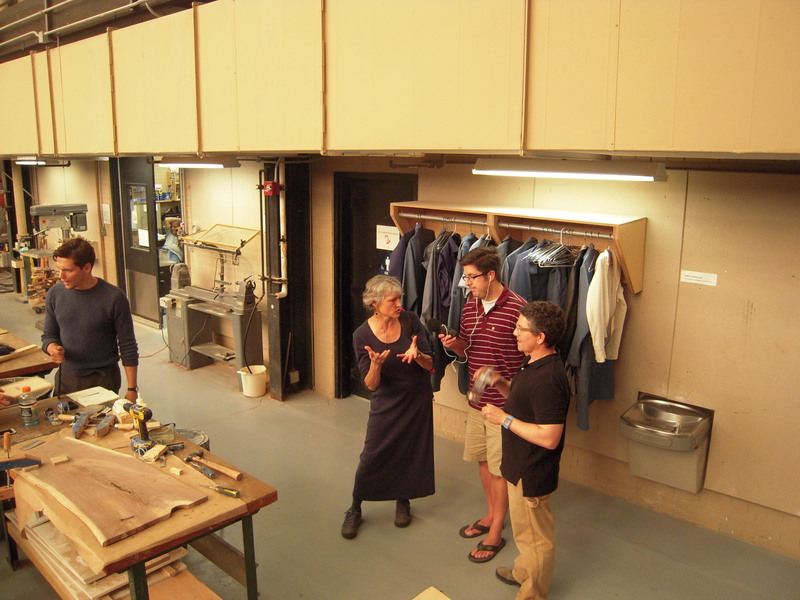 Out of the Loop host Mike Stephen, center, interviews Edith Makra and Paul Pettigrew at the IIT’s woodworking shop. An IIT student plans to turn this piece of urban wood into the top of a coffee table. 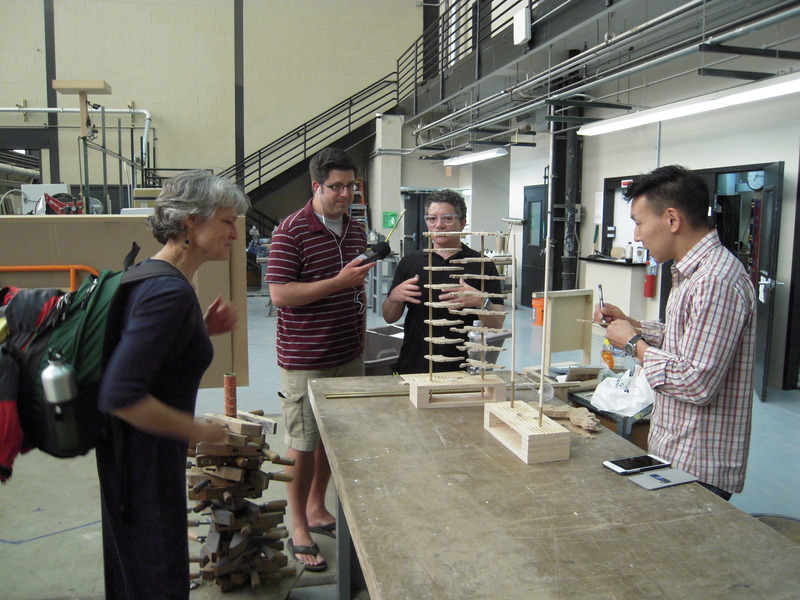 Plans are in the works for the IIT student urban wood projects to be part of a traveling exhibition next summer. The IIT woodshop is housed in a structure designed by Mies van der Rohe. 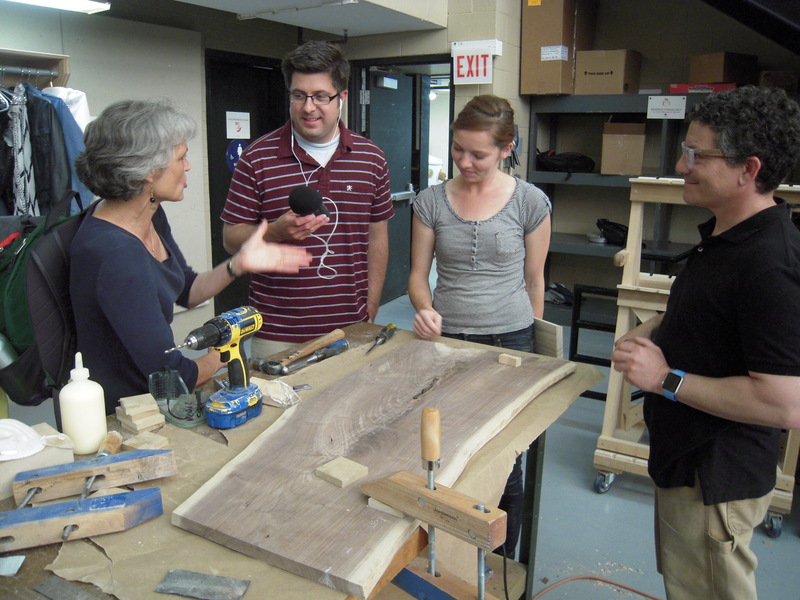 Illinois’ growing urban wood movement recently made a splash when Out of the Loop, an online radio affiliate of WGN, recorded a segment about students using urban wood to make furniture at the Illinois Institute of Technology (IIT). Out of the Loop host Mike Stephen interviewed Paul Pettigrew, an associate professor of architecture at IIT, and Edith Makra, chairman of the Illinois Wood Utilization Team. 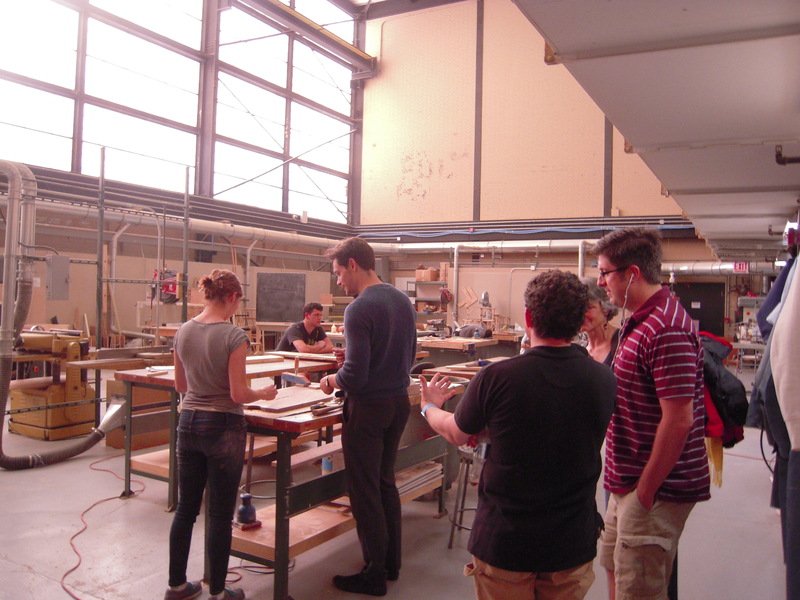 Recorded amid the din of a roaring dust collector and whirring woodworking machinery, Pettigrew explained why he chooses to have students of his popular Architecture & Furniture course use locally sourced urban wood to fabricate furniture and other functional objects. “As students have become more aware of green and sustainable issues they become much more aware of actually where the material is coming from,” Pettigrew said. He added that the urban wood donated by the West Chicago Park District for his summer class embraces sustainability in giving wood milled from dead or dying trees a second life. Makra said the mission of the Illinois Wood Utilization Team is to develop a viable and sustainable market place for urban wood. Pettigrew said the student projects from his summer course, as well as those he plans for his students to make this fall and next spring, will likely culminate in a traveling exhibit to educate consumers and kids about the potential and benefits of urban wood. Click here to listen to the entire podcast. The urban wood segment begins at the six-minute mark.